The second step in the decision-making process is to set your goal. A goal is what you need to achieve (to have, to be, or to do) in a situation. Knowing your goal is critical to making a thoughtful decision. The symbol we use for setting the goal is a target, something to aim for. Goals must agree with –and not contradict– our personal values. Goals that conflict with the things, people or ideas we value are unrealistic and could lead to frustration and/or failure. Aristotle, in the early pages of his Nicomachean Ethics (II, vi,14) quotes a line that had already been established in the Ancient Greek culture of values. Behavior modification, humans helping humans, is a perennial quest which, hopefully allows us to benefit from the successes of our predecessors. A goal is basically a purpose, long or short term, ever abiding, or last to be fulfilled. Goals must not conflict with your value system: the things, people and beliefs that you hold dear. The main acronym for goal setting is SAM. Specific –involving a date or number, not general nor vague. Achievable –realistically within your skill set, can do stuff. Courage is the strength (virtue) of the middle. Measurable –again a number or date may help report fulfillment. 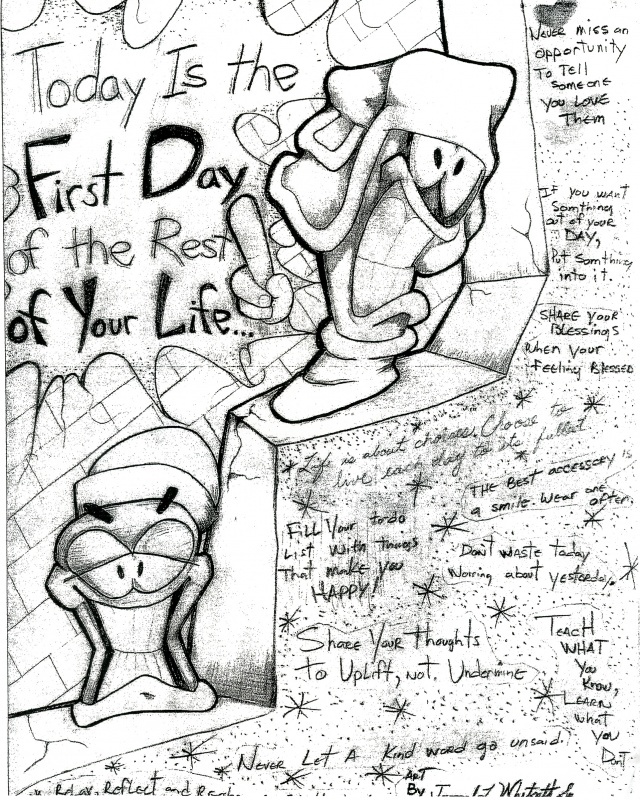 Inmate sketches like this, and others posted on our Thresholds web site, speak of the universal humanity longing to correct itself. Call it “team spirit,” or “shared cognitive process,” or mere empathy, witnessing the progress and gratitude of client inmates is a profound reward for the dozens of volunteer teachers committed to Thresholds.